William Hislop was born at Whitby Township in 1850. He worked as a farmer at Whitby Township. Mary Oke was born at Devonshire England, in August 1850. He and Mary E. (Lily) Oke were married on April 9, 1885. Mary E. Oke died on November 9, 1888 and is buried at Union Cemetery, Oshawa. After working as a farmer for some years, William Hislop retired to Bowmanville. He died on June 16, 1931 and is buried at Union Cemetery, Oshawa. 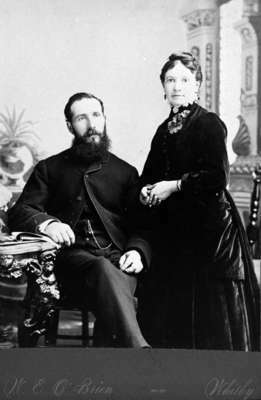 Mr. William Hislop and his wife (Mary E. Oke), c.1885, W.E. O'Brien. Whitby Archives 31-009-440. Scanned from a copy negative.